Audrey Marie Santo was an American girl through whom miracles were said to have happened during her lifetime. In 1987, when Audrey was three years old, she fell into the family swimming pool and was in a coma for three weeks. When she awoke she was unable to speak and had limited movement. Shortly after the accident, Audrey was taken to a popular pilgrimage site where the Virgin Mary is said to have appeared. Audrey is believed to have communicated directly with Mary and agreed to become a “victim soul”, someone who willingly takes on the suffering of others. Audrey subsequently went into cardiac arrest and almost died. Since the pilgrimage there have been many claims of miracles happening around Audrey, including icons and statues weeping blood and oil and people being cured of injuries and diseases by visiting her house which itself became a pilgrimage site. Many people promoted Audrey for sainthood. Audrey’s chart reflects this story. The two planets that are connected with religion are Jupiter and Neptune, Jupiter symbolizing the Church and organized religion, Neptune deals with the inner life and the mystical side of the religion. Audrey Santo has a close conjunction of the Sun in Sagittarius ( itself a visionary sign ) with Neptune and Jupiter. The conjunction occurs in the 4th house of home, family and childhood and it is also in very close opposition to the Moon in Gemini. The Moon is symbolic of youth and childhood and the sign Gemini can often appear quite childlike. Also the fact that the Sun is pulling in the exact opposite direction to the Moon and as Gemini rules both verbal communication and movement this aspect shows the area of Audrey’s life that was sacrificed. If it’s possible for anyone to have religious visions, cure people and perform miracles it would be Audrey. The fact that all this happened to a young child is clear from the chart. 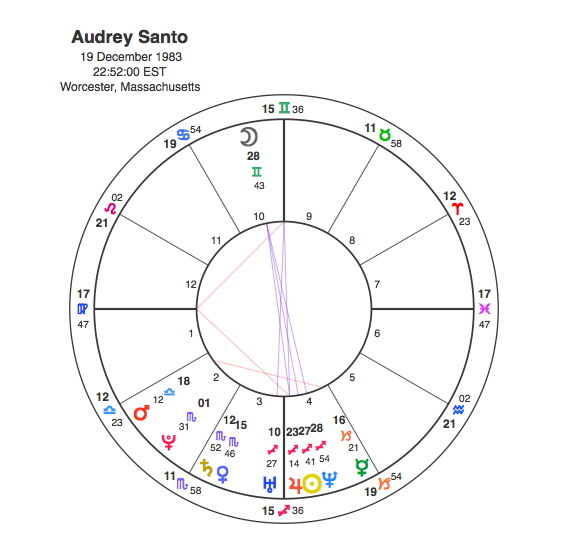 As her Sun, Moon and Ascendant are all in Mutable signs and the Sun and Moon are very closely aspected to Neptune, Audrey would have very little sense of herself. It is almost as if she didn’t exist as an individual, just as a vehicle for something much greater. Audrey died at the age of 23 in 2007 from complications initially caused by the accident in 1987. Pluto was conjunct her Sun / Neptune and opposite her Moon in 2007. Because she died so young, Pluto only made this one significant aspect in her lifetime. The aim with these astrological pictures of famous lives is to stick purely to the transits of Pluto. In Audrey’s case, because there is only time for one aspect, it is relevant to point out that Uranus transitted exactly the same degree conjuncting the Sun / Neptune and opposing the Moon in 1987 at the time of the original accident and the pilgrimage where Audrey Santo communicated with the Virgin Mary. Perhaps the real miracle was the astrology of her life.